Sean grew up outdoors, with an oceanographer father, who had his children sailing, fishing, and clamming from birth. 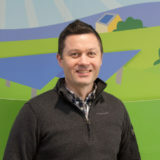 Now Sean carries that passion to restoring our planet, having worked in numerous environmental fields, including solar energy, wind energy, green building, and scientific technical writing. Sean previously worked in residential rooftop solar, and helped nearly 200 Vermonters go solar. Now he is excited to provide Community Solar Array (CSA) memberships to upstate New York customers. Sean holds a Bachelor of Business degree from McGill University, Montreal, Quebec. He grew up in Nova Scotia, but eventually returned to his family’s New England roots, settling in Vermont over 17 years ago. In his spare time, Sean enjoys fishing, hunting, camping, skiing, and all things outdoors, exploring Vermont and Maine, with his wife, daughters, and extended family.